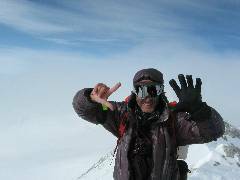 "A Peak Practice of a Lifetime"
LATEST NEWS: On 2nd Jan 2009, Lorenzo summited Vinson Massif and thereby completing the Seven Summits and becoming only the third Italian to have done so, after Reinhold Messner and Giuseppe Pompili. The text that follows is Lorenzo Gariano's description of his personal quest. There are seven continents on Earth. 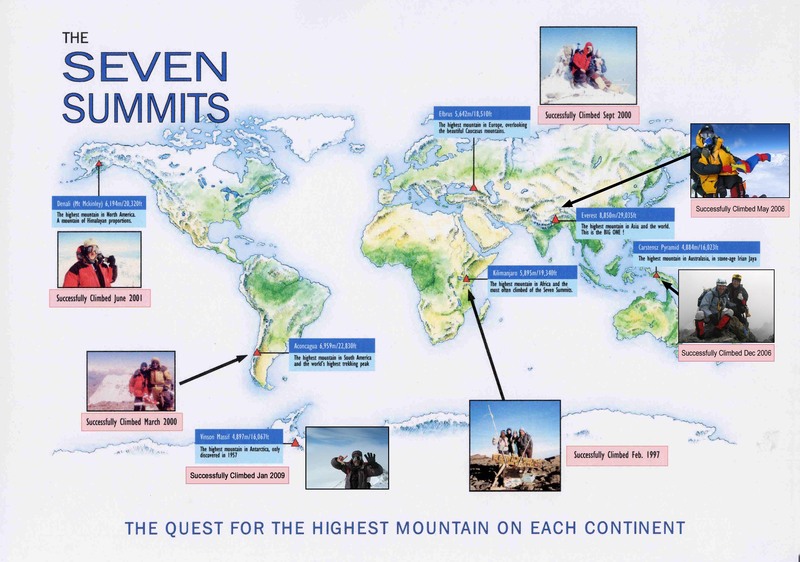 Lorenzo's aim is to try to successfully climb the highest mountain on each continent! There is nothing new in this ambitious challenge, but the fact remains that to date well under 100 people have ever accomplished this feat. Money to finance this project is perhaps the hardest challenge to face even the most determined of climbers. 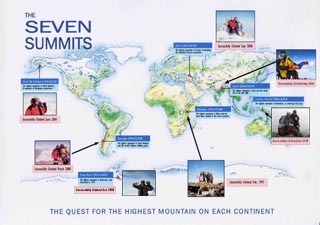 To his credit Lorenzo has already successfully climbed six of the seven summits. His forthcoming seventh and final peak is Vinson Massif on the great wilderness continent of Antarctica. After funding the first four peaks totally by himself, Lorenzo is now looking hopefully for some financial support from any individual or company which has enthusiasm and vision for this exciting and ambitious challenge. "But what's in it for me?" you may rightfully ask, since requests for money are almost a daily occurrence in today's society. Well, due to the nature of this unusual and arduous challenge, Lorenzo has already received exciting coverage in local newspapers, magazines and interviews on BBC Radio Northampton (all above copies are available on request). Naturally, the support of sponsors would be included on these media channels in future coverage. Additionally, the companies' names and logos can be displayed in photos, interviews and on local TV as the challenge will gain momentum with the final challenge, Mt. Vinson, especially since Lorenzo will be only the second Italian to have completed all seven. Lorenzo could also link money to be raised for a charity you feel committed towards. The whole package is potentially very exciting for its content of originality and would, no doubt, make exciting reading in your own company newsletter or magazine. "I am very much looking forward to completing my lifetime challenge, and hope to share, with your support, emotions, dreams and views that are truly so fresh and unique in this, at times, stale and automated world!" My sincerest thanks for reading this. KMi also collaborated with Lorenzo to do podcasts from The Matterhorn and Lhotse.